To me, the atmosphere of a cafe is paramount. I don’t know about you but if I go somewhere and I’m not acknowledged and greeted with a smile I feel like turning around and walking straight back out again! That’s why, in recruiting my dream team a smile and a welcoming, enthusiastic demeanor are a must. We’re going to be a fairly small team so you’ll need the ability to turn your hand to a range of jobs. You may find yourself as a Barista, making amazing coffees for people in a hurry, poaching eggs for brunch, helping me with cakes, manning the till or clearing tables (this list is not exhaustive)…experience is very welcome but not entirely necessary. I’m more than happy to teach you skills as long as you’re keen and willing to learn. 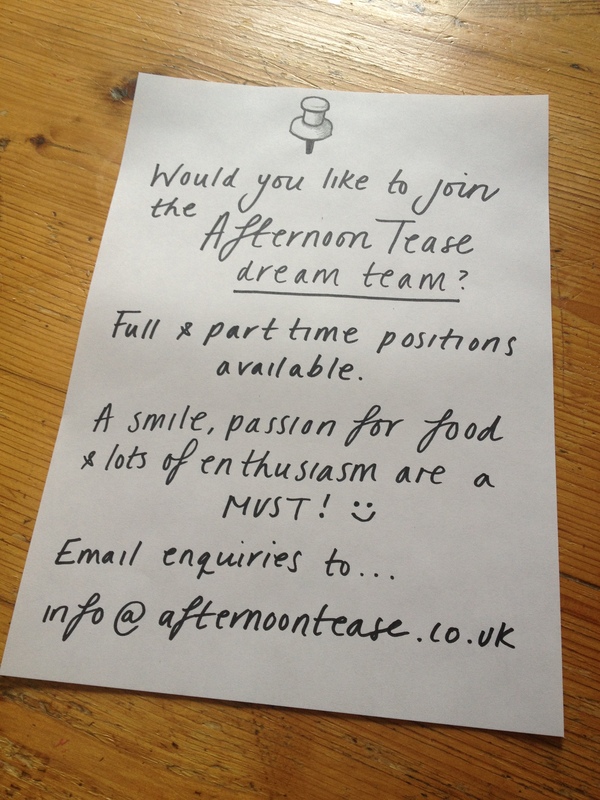 If you would like to join me on the adventure of opening Afternoon Tease please send me an email to info@afternoontease.co.uk telling me a bit about yourself, your interests and experience along with a CV and I’ll be in touch shortly. To find out a bit more about Afternoon Tease click here. You can also follow my journey on my blog. How very exciting. I will spread the word if I hear of anyone looking for a foodie job! Would you be at all interested in someone who could only work during holidays or at a very haphazard part time basis during term? I’m a student at Cambridge (but also happen to live in the area) and the university is very finicky about us seeking work during term time. I love food (particularly your cakes.. and your comment on twitter about a steakandhonour popup has led to a very diet damaging addiction) so would be overjoyed to have the opportunity to help out at the Afternoon Tease cafe. This comment is simply me wanting to be honest about the commitment I could put in before I submitted a CV or anything as to not waste your time. At the moment I’m looking for people who can work during term time. However, please drop me an email with your contact details and I can get in touch if I need help during the holidays.